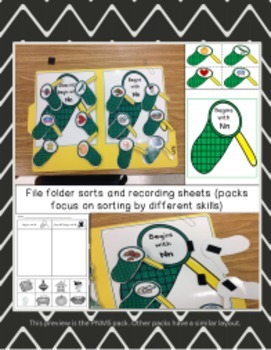 Print sorting mats and attach to a file folder. Students will sort pictures for each letter based on beginning and not beginning with the given letter. Recording sheets are included. Students will sort pictures onto a sorting mat based on beginning sounds. This activity can also be used in a pocket chart. 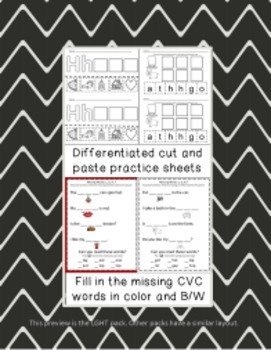 Students will use dry erase markers to fill in the missing words that match the pictures. At the bottom, students will read additional CVC words and check each word that they read. Group 1-Students will place the magnet letter on the picture with the same beginning sound. 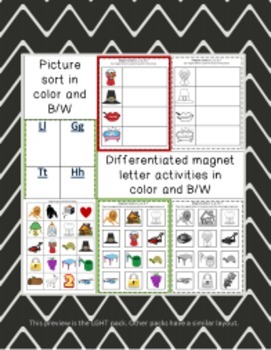 Group 2-Students will use magnet letters to spell CVC words matching the pictures. Group 1-Students will cut out the pictures and glue the 3 pictures that have the correct beginning sound. Group 2-Students will cut out the letters and glue them in the correct order to spell each word. Most activities are available in color or b/w and are aimed to help students on different levels of phonics readiness. Want all of the Phonics Station packs?? 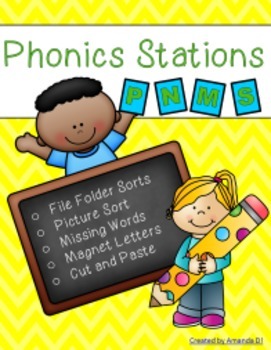 Try the Phonics Station Bundle!